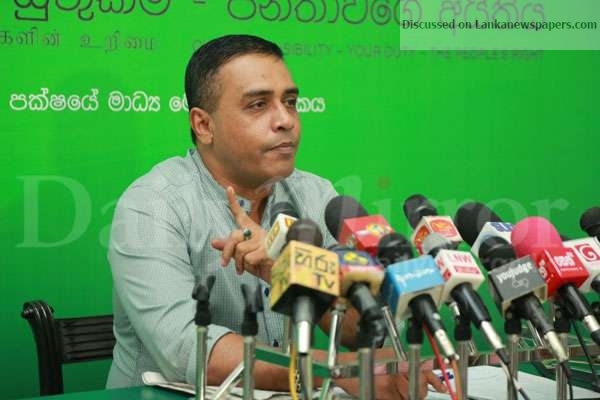 UNP MP Thushara Indunil said today his party was not on panic mode over speculation of moves being made to form an interim government in the wake of discussions between President Maithripala Sirisena and former president Mahinda Rajapaksa. He told a news briefing that instead his party would obtain the support of six SLFP MPs to form its own government in place of the current national unity government. “We have 106 MPs and need the support of six more members to secure a majority in Parliament. Some SLFP members have expressed their willingness to join us if we decide to form our own government. We have already held several rounds of discussions with them and as such forming a UNP government is not much of a challenge,” the MP said. “We don’t expect the President to join the 16 SLFP dissidents and the joint opposition members who abandoned him at the 2015 presidential election,” he said and challenged the JO and the 16 disidents to topple the government by defeating next month’s 2019 Budget.